Is Your Child Chic? Bento Designer Lunches Rule for School! In a new variation of designing for users, Moms around the world are gearing up to make their kids the most fabulous lunches they have ever experienced. Fortunately, for those blissfully ignorant of Bento and the latest designer trend of “cute food”, a host of sites and experts exist to help you make your babies lunches the BEST lunches their peers and teachers have ever laid eyes on. And I think it’s great, because who says the food we eat to sustain us can’t be healthy, appealing to look at, a little mischievous and FUN? This picture, from Cooking Cute, a website by dedicated mother and Bento-designer Ngoc, is just one of many examples of a Bento-styled lunch. Audrey is her niece, and this meal really is a thing of beauty… what a treat to open your lunchbox and find something like this in it! I cannot help but think the Bento concept is adorable, while simultaneously being thankful I have no school-age children to prepare these time-consuming treats for. The Oilman likely would not appreciate the gesture of having cute food on his plate, though he has gotten used to every meal having a “theme” such as Greek, Italian, French or my personal favorite, Tex-Mex, featuring authentic Texas flavors, such as mesquite-grilled meats and veggies. No Kansas hickory for me, thank you! Alanna Kellogg provides a great introduction to Bento over at BlogHer. If you’ve never before heard of Bento, or are new to this designer food craze, start here for six easy lessons for taking Bento back to school this year. The definitive site for all things Bento… pictures, recipes, tips, links, resources, an A-Z glossary and more! 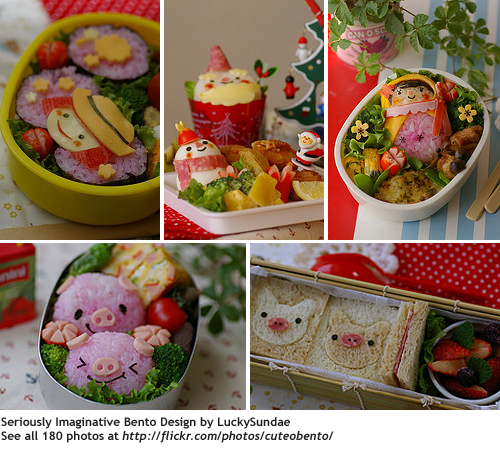 LuckySundae’s Beautiful Bento Design – 180 Meals! 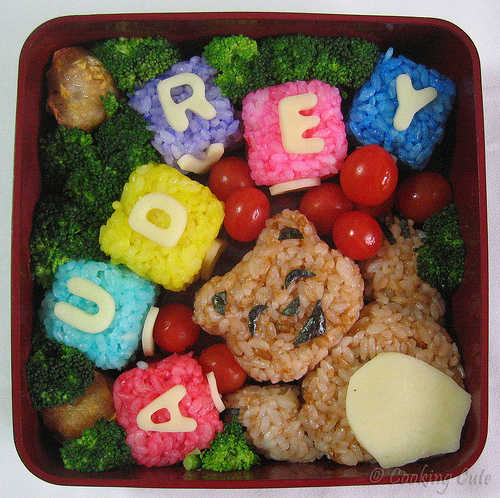 This Bento designer’s work was featured in the book “Face Food” and you’ll see why after looking at these photos… very creative, charming and whimsical… not to mention edible! Very neat modular lunch box with 5 microwave-safe containers that fit inside, from Reusable Bags. Perfect for kids or adults who want to take lunch to work. I covet these beautifully decorated lunchboxes… they’re enough to make me want to try serving Bento lunches around here after all! Fortunately, Ngoc has posted links to retailers where she purchased them, so be sure to check them out for even more Bento container options. Packed with love, for you… great Bento-centric blog with lots of tasty photos and food for thought, though it makes me yearn to eat lunch apart from The Oilman instead of with him as we usually do, just so I can leave him sticky notes with adorable drawings on them with his packed meal. Do you have any Bento-making experience? I’d love to hear your comments and see photos if you have them to share.